The following are among the many dining and nightlife opportunities awaiting you in Palm Springs. Palm Springs, California is the place where you can stay in one place but experience a lot of shopping. In downtown Palm Springs, a variety of specialty stores, boutiques and shops are lined up to offer you a variety of options. From the most expensive to bargain-value items, souvenirs and a lot more; you can find it all in just one area. If you’re trying to escape the hassles and stress of the city but can’t seem to breakaway from its luxurious amenities, then come to Palm Springs for a perfect blend of urbane convenience and ecological refreshment. Enjoy life at Palm Springs as you take a fun trip to its deserts and mountains and wind down to its first class dining, entertainment, and shopping offerings. 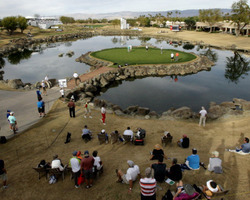 It's no wonder the TPC Stadium Golf Course has been the site of so many high-profile events, including The Skins Game, The Bob Hope Chrysler Classic, The Liberty Mutual Legends of Golf, and the PGA Grand Slam of Golf. 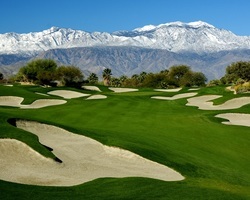 The PGA WEST TPC Stadium Course, designed by Pete Dye is ranked in The 100 Greatest Courses in the U.S. by Golf Magazine. Revered for its brash beauty and intriguing design, nine of the holes have water very much in play, and almost every hole displays Pete Dye's tremendous bunkering. This course at PGA WEST designed by Greg Norman lies in a seabed 40-feet below sea level surrounded by an immense crescent of terra-cotta mountains. The course teems with purple, white and yellow wildflowers, while the mix of tall and short native grasses produce different shades of green running almost to silver. The grass covers just 60 acres of tight fairways that taper toward the greens with nine ponds covering 18 acres. The demands of this course are a challenge for players of all levels.